The Sarah Moody Gallery of Art presents the exhibition Alice Hohenberg Federico: The Liberation of Clay November 29, 2018 – January 11, 2019. The artist will present a lecture about her work Wednesday, Nov. 28, at 6:00 p.m. in 205 Gorgas Library. The public is invited to the opening reception for the exhibition, Thursday, Nov. 29, 5:00 to 7:00 p.m.
New York artist and Selma, Ala., native Alice Hohenberg Federico works on the potter’s wheel to create sculptural vessels that transcend function. As she puts it, these vessels are “metaphors that are abstractly figurative.” Her work is influenced by ancient Greek pottery, as well as a fascination with Austrian-born British studio potter Lucie Rie’s work. “Pieces are pulled and twisted, wrapped – they are expressive, singular. To me, some are even imperfectly perfect,” said Federico in an interview with art historian and critic Vered Lieb. Lieb has written an essay about Federico’s career and work for a catalog to accompany the exhibition. Federico is represented by George Billis Gallery, New York, N.Y. Her work has been featured and reviewed in Women with a Voice, the Wall Street Journal, the New York Sun, The New Republic and Clay Chat. 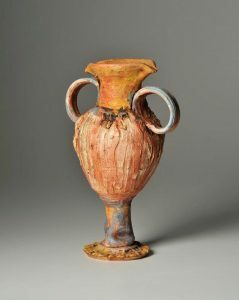 She did her undergraduate work in history and received an MFA in ceramics from East Carolina State University. She returned to school later to study ceramics with renowned master potter Ken Ferguson at Kansas City Art Institute where she earned a BFA degree. In conjunction with the Federico exhibition, selections from the Permanent Collection of the Sarah Moody Gallery of Art at The University of Alabama will be on display. The Permanent Collection is dedicated to works on paper including prints and photography. Paintings, drawings and small sculpture will also be featured. Image credit: Alice Hohenberg Federico, Water from the Desert Well, 1320, white stoneware clay, 14 inches high. The Sarah Moody Gallery of Art is supported by The University of Alabama College of Arts and Sciences and the Department of Art and Art History. For further information, contact the gallery at (205)348-1891 or go to our website: https://art.ua.edu/gallery/smga/.